Many of America’s national parks remained open during the country’s longest-ever government shutdown. But few had enough National Park Service employees working to protect the areas and keep watch of visitors. Those visitors did a lot of damage in 35 days. They walked over sensitive lands. They opened gates while no one was watching. One person even struck one of California’s famous Joshua Trees with a vehicle. When park service employees returned to work last week, they began cleaning up and repairing what they could. But environmental experts warn that the damage in some places could take years to recover. Even before the shutdown, national parks faced $12 billion in much-needed repair work. That number has only grown. Many parks had no employees working during the shutdown. Others had skeleton crews.. Local governments and nonprofit organizations offered money and volunteers during the shutdown, which began on December 21 and ended on January 25. National Park Service spokesman Mike Litterst told reporters that the damage was not widespread. He said most visitors took good care of the land. But interviews with park officials and nonprofit groups that help keep parks running tell a different story. Angie Richman is a spokeswoman at Arches National Park in Utah. She said visitors left human waste outside a bathroom, walked on trails within an area that was off-limits to visitors and damaged an entrance gate. At Joshua Tree National Park, an off-road vehicle ran over one of the park’s special trees. Several other Joshua trees were damaged, including one that was spray-painted. A former Joshua Tree National Park ranger told Smithsonian.com that it could take 200 to 300 years for the park to fully recover from the shutdown damage. At Great Smoky Mountains National Park, visitors cut locks on some gates to closed roads and stole about $5,000 in repair tools, spokeswoman Dana Soehn said. Employees at Death Valley National Park in California found human waste and toilet paper all across the desert. Park officials also found evidence of people kicking in locked bathroom doors. And a high-speed video on Death Valley’s Facebook page showed how it took staffers two hours to clean a bathroom overflowing with trash and covered with waste. Workers at Death Valley National Park must replant in areas damaged by off-road vehicles. All of this delays much-needed repairs in other areas of the 1.3 million-hectare park. At some parks, the lack of people meant animals moved in. 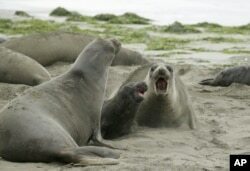 A colony of elephant seals took over a Northern California beach in Point Reyes National Seashore. There were no workers there to prevent the animals from gathering in the popular tourist area. Park rangers and volunteers are now leading small groups of visitors to safely see the seals and their young. The possibility of another shutdown remains. President Donald Trump and Congressional leaders agreed to a temporary spending bill that re-opened the government for three weeks. Trump has said another shutdown could start February 15 if he and Democratic leaders cannot agree on money for a U.S.-Mexico border wall. The Associated Press reported this story. Ashley Thompson adapted it for VOA Learning English, with additional materials from Smithsonian.com. Caty Weaver was the editor.